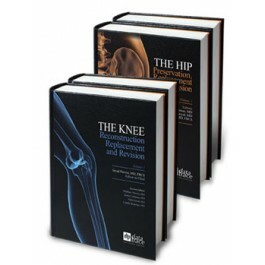 This comprehensive set of textbooks contains the relevant and concise information available on the topics of Hip and Knee disorders and how to treat them. With 4 complete volumes, it is a must-have for students and experienced surgeons alike. The Hip: Preservation, Replacement, and Revision is an authoritative reference that offers current, comprehensive guidance related to all disorders of the hip with chapters on diagnosis, classification, and management of periprosthetic infection, including data from the recent Consensus Meeting on PJI. Contributions by more than 200 international experts make up the four sections: Foundations of THA; Joint Preservation; Primary THA; and Revision THA. Topics covered, range from non-arthroplasty management of hip conditions, such as arthroscopic and open management of femoracetabular impingement, management of Perthes disease in the adult, and surgical management of residual DDH, to revision topics including custom implants for pelvic discontinuity, allograft prosthetic composites for massive femoral defects, and so much more. 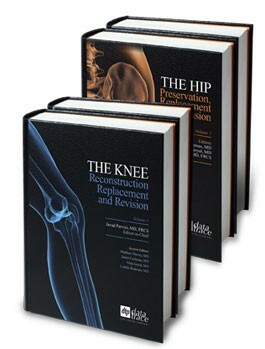 The Knee: Reconstruction, Replacement, and Revision has been written with one fundamental objective in mind: relevance. The authors, world renowned experts in hip and knee reconstruction, offer highly practical information based on their experience. Knee reconstruction surgeons will benefit from the step-by-step guidance and significance of details on treatment of each knee disorder. There are a number of chapters on the basic fundamentals of knee surgery that aim to help surgeons prevent complications of TKA and optimize the outcome of this procedure. The nonreplacement, joint preservation options for treatment are also provided whenever appropriate. The over 1500 pages are richly illustrated with color figures, diagrams, and tables that visualize important information and help establish this book as a highly valuable resource.